The Industrial Workers of the World is a revolutionary union. 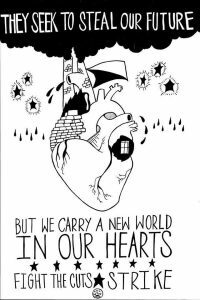 We aim for big goals, to abolish the wage system and create a more free society. It is useless to strive for revolutionary change without being also being active in fighting for day to day material improvements. And there is no better place to do than at our workplaces. This is the area where we are already forced to spend most of our time, and we should use that time to build connections and challenge the bosses’ power at its heart. By organizing at work we can connect with other people where they are at, and build more and more collective action for collective problems. Unlike business unions, we have no permanent staff, and at the local level our union is entirely volunteer-based. Remember, YOU are the union. With active participation from you and workers like you, we can make a difference and win major improvements. Without your participation, we won’t have that power and things will stay the same. Without a union, we only have ourselves to rely on at work. The problem is that the boss brings a huge amount of power to their side of the negotiating table. When we enter into an employee – employer relationship with them, our boss has all the power. Whether we work for a multinational corporation, a small business, a nonprofit, a church or a community organization, the boss has power over our working lives. The boss sets wages, determines policy, can hire and fire us at will, and give us very little say over our lives at work in general. We need a union because partners need guaranteed hours, stable schedules, and better wages. We need a union to balance the scales and bring some power back to our side of the bargaining table. By uniting into a strong, independent organization, we can do that. A union means never having to go through work alone again. What are the problems that we face at work? Some may be obvious like pay too low to make ends meet or disrespectful managers. Others could be less common and unique to your workplace. The first step to making our jobs better is figuring out the problems that need to be fixed. Talk to your coworkers and find out what issues they may have. 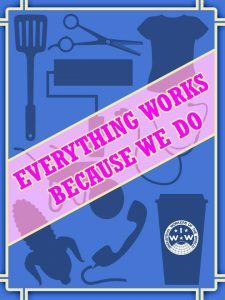 If there are other IWW members in your store, discuss it with them. Find out what each coworkers particular issues are. Your problems might not be the same as everyone else’s. January 14-15, 2018. 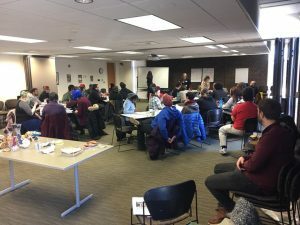 The IWW’s Workplace Organizer Training 101 in Milwaukee, 43 people learning the basics of one-one-ones, social mapping and direct action to build power at work. 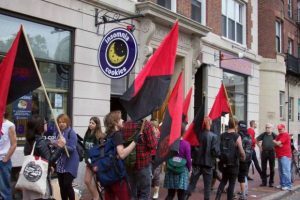 Talking to your coworkers about the union can be tricky and could blow your cover if you do it wrong, so if possible attend an IWW Organizer Training before attempting it on your own. Ask your delegate about upcoming trainings. Before starting a conversation about the union, you have to think about the social groups in your workplace. What are the friend groups? Do people share important interests outside of work? How do gender, age, or race and ethnicity affect the social dynamics within your store? While it can be tempting to simply talk to your good friends about the union first, the most important thing is to find those who play a leadership role at work. No, this doesn’t just mean the shifts! Leaders are the coworkers that others ask for advice or turn to for help. Leaders are those who offer support and guidance to fellow partners and who are well liked and respected in the workplace. Social leaders should be the first people you talk to, because it’s hard to organize a union in your store without them! Once you’ve identified leaders you can start conducting 1-on-1 organizing conversations with them as long as you feel comfortable doing this and have attended an IWW Organizing Training. If you haven’t been trained, asking a more experienced organizer to conduct the organizing conversation is highly recommended. If everyone is OK with it make sure to be present for the organizing conversation so you can watch how it works first hand and gain the confidence and experience necessary to do them on your own. The most important building block of building a union in an un-organized workplace is the workplace committee. A workplace committee is simply workers in a particular workplace coming together to make decisions and carry out an organizing plan. Members of a committee work together to overcome obstacles to organizing. 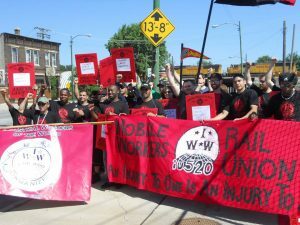 Once there are a couple IWW members in your store (even just 2 or 3) it’s time to start meeting as a committee. Your committee should meet regularly, if possible every week or every two weeks at minimum. 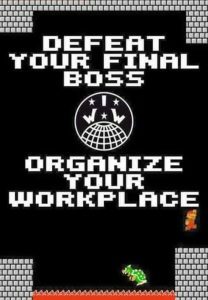 Everyone should participate and take on a task for the union. Not only does this make the work easier by spreading it around, but it builds confidence and experience for new union members. Once you have an organizing committee and are meeting regularly, its time to start planning ways to take action at work. We take action at work to make our voices heard in a way that bosses can not ignore. 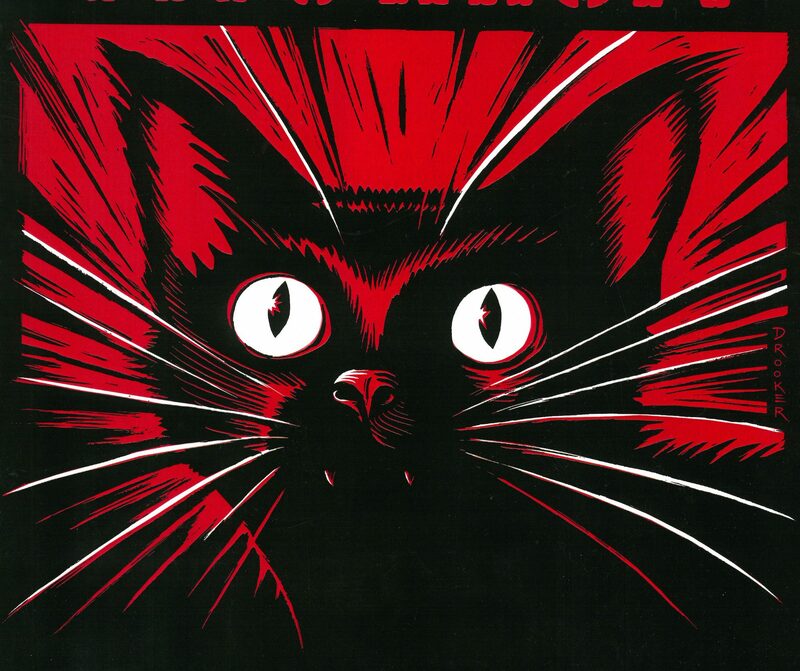 Actions take many forms, and the IWW has been creative in the past. There are many ways you and your coworkers can put pressure on the company. For instance, strikes or short work stoppages, informational pickets for customers, work slowdowns, work-to-rule, or presenting a petition signed by everyone in the store to a manager are all valid workplace actions. Once you’ve been part of an action at work, there’s still a lot to be done. The employing class is well organized and well-connected across the world. A workplace campaign at one business or in only one city can only do so much to challenge the wealth of the capitalists. To increase the pressure to raise wages and improve conditions, we need to spread the campaign as much as possible. Meet with other workers in your industry, and with other industries, to build connections. Collective discussion, collective planning, collective action. Creative outreach is another important way you can build the union. Artwork, opinion pieces, posters, internet memes, music, and video can all be good ways to reach out to others about why the union matters. Outreach to the community in general is important too. 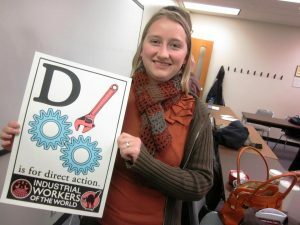 Get involved with other local unions and labor groups and invite members to IWW events. Talk to your family and friends and ask them to support the union. Community members can help in a variety of ways including monetary donations, volunteering to help with union activities, and publicly supporting the union. Every organizing committee should start compiling a list of supporters to be part of a “rapid response team.” Then in the event your boss engaging in any illegal retaliation, the committee would be prepared to utilize community support to protect our members. No matter how successful our campaigns are in the short term, we can’t stop looking ahead for the future. The more we strategize and plan for what comes next, the better prepared we will be. Whatever we are able to win in improvements we will need to maintain by continuing to build and strengthen the union. Union members who are interested should talk to their delegates about long term strategic planning and how they can help. Building bridges between ourselves and other industries is important. Ultimately, we should focus on being a union that fights for all workers. The more workers and workplaces that are part of a union campaign the more pressure can be put on the bosses. When we support the other workers in their struggles for better lives and dignity, that support will come back to us when we need it. Solidarity with each other and with all workers is our best tool.